As some of you may know, I’m an organizer for the Office 365 User Group in Hamburg. 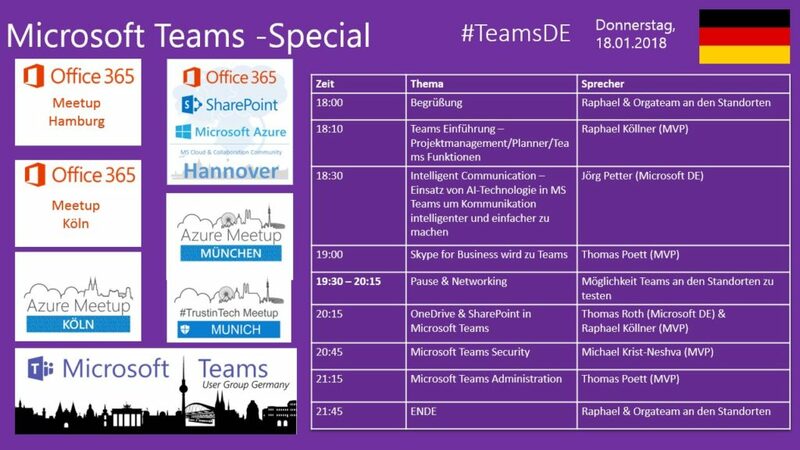 On January 18, there will be a DACH region Teams Special which is organized by Raphael Koellner at the Office 365 User Group Germany in Cologne. Please find the current agenda on the next picture. Most speakers are located in Cologne. Other locations like Hamburg will join the session via Skype for Business. For several reasons we decided to not make a public stream available. Talks are supposed to be in German language. How can I join the event? Wherever you plan to join, the event will be for free – that means we do not take any money from you to join the meetup. 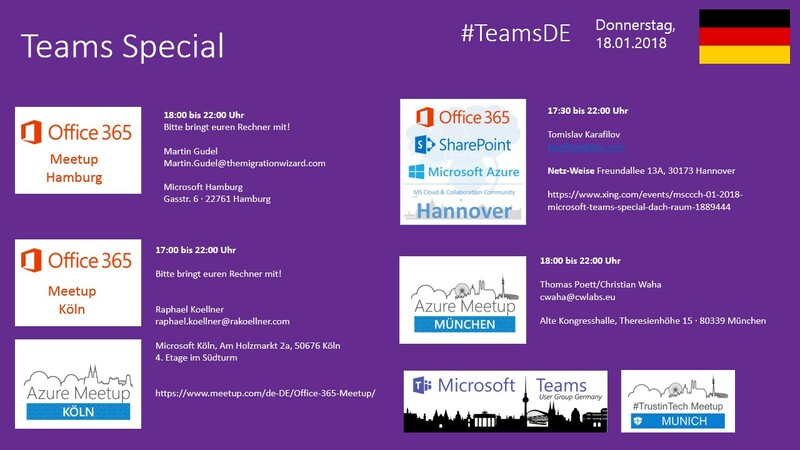 Just join the event and get the latest input about Microsoft Teams use cases like using it for project management or typical daily administration tasks. We will try to make the meetup hands-on, so please also have your Windows 10 laptop with you if you plan to join in Hamburg. Free Wifi will be delivered by Martin in Hamburg. Basically, your Macbook is also fine. But please understand that Martin will not be able to support you in case something went wrong with your Macbook. As seats are limited, please note that you are expected to register on our meetup page in order to join in Hamburg. Will you publish the slides? Basically in Hamburg our goal is always to get the slides after the session to publish it on the meetup pages (or at this blog) whenever possible. Unfortunately that depends heavily on the speakers which will need to provide us with the slides. If you don’t find links to the slides at this blog a few days after the event, feel free to ask us about when we will deliver it! We will broadcast a meetup live stream between Hamburg and the other location which will capture audio and video of the meeting room. We cannot filter the stream during the session. Please understand that you must agree to the fact that we may capture your picture and your voice as long as you join the room. You must not join if you do not agree. Thank you to all organizers which made this event possible! Give special credits to Raphael Koellner.